Mini Forestry Claw in action. Berlon Industries added to its mini skid-steer attachment arsenal with the Mini Forestry Claw. The Mini Forestry Claw’s strength and durability allows users to load, unload and transport large logs and debris up to 2,000 pounds. The claw is fully articulated, granting free movement without having to move the machine, according to Berlon. It features high-visibility orange claws; a saw scabbard for easy transport of saws; a 60-inch opening; aggressive teeth with teeth plates connected to the mounting plate; and extra reinforcements in critical areas to prevent bending, Berlon said. 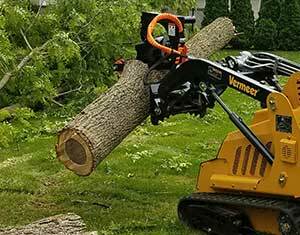 A built-in tree pusher helps assist in felling limbs, and two rope bollards aid in directing limbs. An optional hitch receiver is also available to move trailers or chippers. The product comes standard with the mini universal mount. Other mounts are also available, including Vermeer, Toro, Bobcat, Giant, Ditch Witch and Boxer.